Lehigh Valley got crushed, but Scott Kingery hit 2 HR and Dylan Cozens hit his 18th? Reading split a double header, Mitch Walding hit his 18th HR. Clearwater lost in a walk off, wasting Jose Taveras six shutout innings. Lakewood lost as Nick Fanti (5-1, 2.74) suffered his first loss. 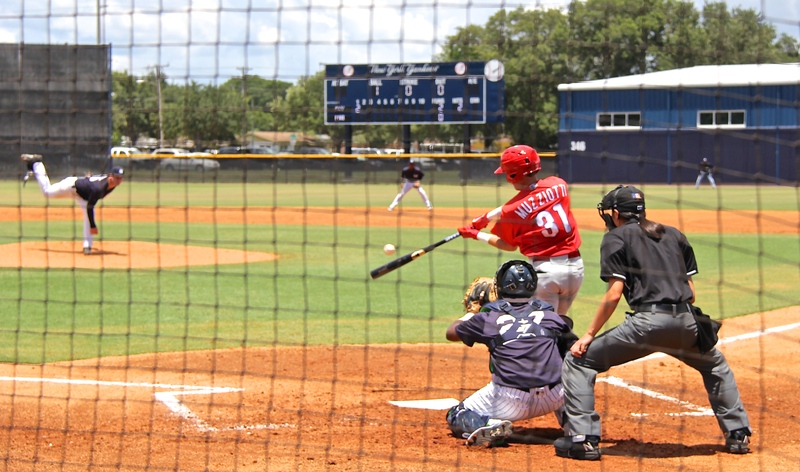 The GCL Phillies split their season opening double header. Adam Haseley had 3 hits, Zach Green hit 2 home runs. Lehigh Valley (49-29) lost to Pawtucket, 14-5. Cesar Ramos (4-2, 4.02) gave up 7 runs on 11 hits and 3 walks in 5.0 innings. Colton Murray (4.95) and Michael Mariot (4.60) gave up 7 runs. Jorge Flores recorded the last four outs. Scott Kingery went 2-5 with 2 HR (2) and 3 RBI. Dylan Cozens hit a solo HR (18) that it barely cleared the fence. Reading (44-30) split with Harrisburg, losing 4-3, and winning 4-1. Game One: The Phils provided a 3-0 lead that they couldn’t hold over the last 3 innings. Drew Anderson (3.68) gave up 2 runs on 3 hits and 4 walks in 5.0 innings and struck out five. Austin Davis (2-1, 2.73) blew his first save and took the loss with 2 runs in 1.0 inning. Carlos Tocci had 3 hits, a double, and 2 RBI. Drew Anderson went 2-2 and scored twice. Zack Coppola had an outfield assist (second base). Game Two: John Richy (6.26) provided 4.0 innings of one-run ball. He gave up 4 hits, walked none, and struck out four. Alexis Rivero (2-1, 3.38) was awarded the win as the least effective pitcher, walking 3 in 1.1 innings. Tom Windle (6.50) stranded 2 inherited runners, retiring the 2 batters he faced. Yacksel Rios (2.12) earned his second save striking out the side in his one inning. Jiandido Tromp had 2 hits. But, the offensive hero was Mitch Walding who drove in all 4 runs with a SF and his 18th HR. Clearwater (41-34) lost to Fort Myers, 3-2. Jose Taveras (2.33) shut out the Miracle for 6.0 innings. He gave up 5 hits, walkse 3, and struck out five. He left with a slim 1-0 lead. Luke Leftwich (3.64) blew the save (his fifth) and surrendered the lead. After the Threshers came back to tie, Tyler Gilbert (0-4, 3.00) lost the game in his second inning of work on three consecutive hits in the ninth. Mark Laird and Wilson Garcia had 2 hits each. Jose Pujols had an RBI double. Emmanuel Marrero had a SF. Cornelius Randolph went 0-3 with 3 K and a HBP and a SB (4). Lakewood (41-35) lost to Greensboro, 8-3. Nick Fanti (5-1, 2.74) suffered his first loss giving up 5 runs on 8 hits. he walked none and struck out four in 5.0 innings. Mauricio Llovera (2.34) gave up 3 runs in 3.0 innings. Felix Paulino (6.50) pitched a scoreless inning. Mickey Moniak (.276) went 3-5 with a solo HR (3). Luke Williams had 2 hits and an RBI. Darick Hall and Edgar Cabral had 2 hits each. Henri Lartigue had an RBI double. Williamsport (2-6) no game scheduled. Joe Jordan taking notes after Haseley’s double. I think he’s copying off the guy in the straw hat. 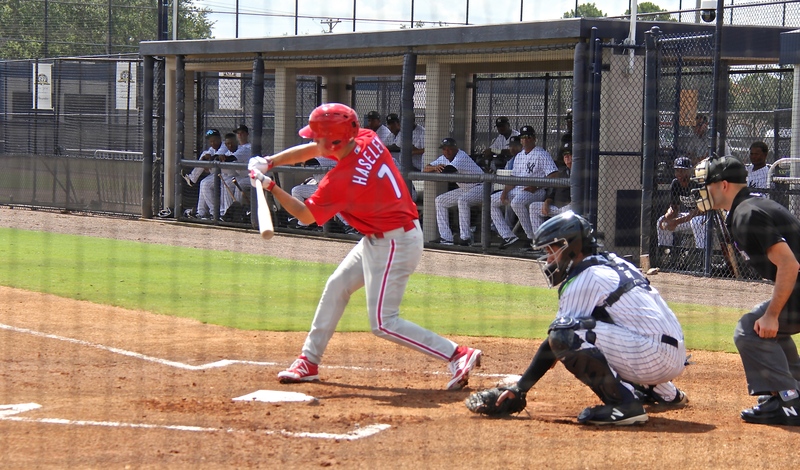 Game One: The young Phillies faced a rehabbing Scranton (AAA), Chaz Hebert, and chased him in the second inning. Zach Green jerked a solo HR in the second to start the scoring. three batters later, Hebert left with Kevin Markham (BB) on third and Bet Pelletier (single) on first. 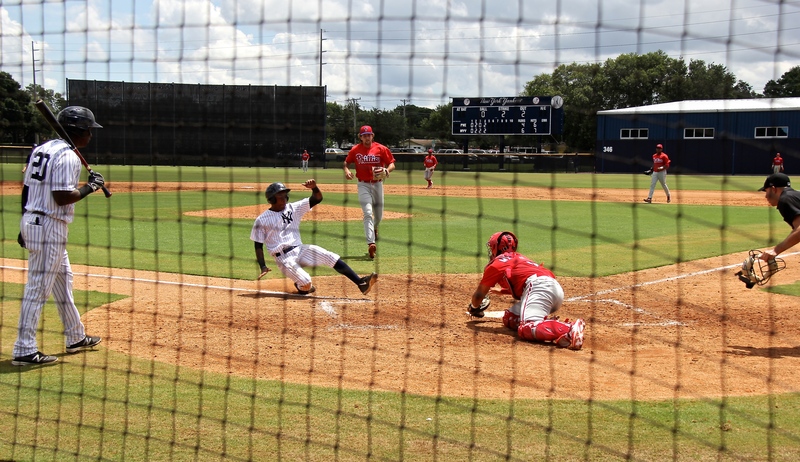 Markham scored on a SF by Edwin Rodriguez. The Phillies came back from 2-run deficits in the fourth and fifth on RBI singles by Brayan Gonzalez and Yahir Gurrola in the fourth, and Zach Green’s 2-run HR in the fifth. They took the lead on Brayan Gonzalez’ 2-run HR in the sixth inning. Jose Jimenez gave up all 6 runs in 3.1 innings. Justin Miller earned the win with 1.1 scoreless. And Rafael Carvajal earned the 6-out save, allowing one hit and getting the final out with his only strike out. Adam Haseley went 3-4 with a line drive double down the left field line for his first professional hit in his second at bat. He had 2 singles on an infield hit to short and a line drive to right. Pelletier, Green, and Gonzalez had 2-hit games. Green and Gonzalez had 3 RBI each. Gurrola and Ed, Rodriguez had one RBI each. Kevin Markham walked twice. 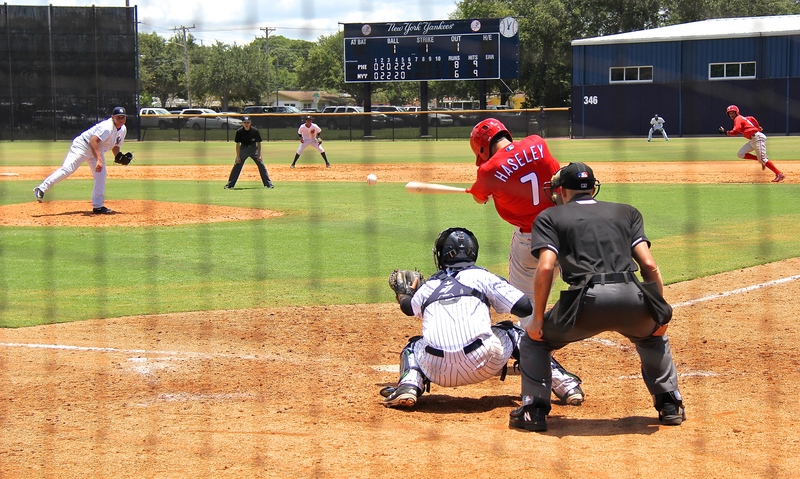 Haseley’s first at bat. This check swing was ruled a third strike. Here is video of the first 3 pitches of Haseley’s first at bat. Note the stance. Sort of reminds me of a left-handed Hunter Pence, with plate discipline. 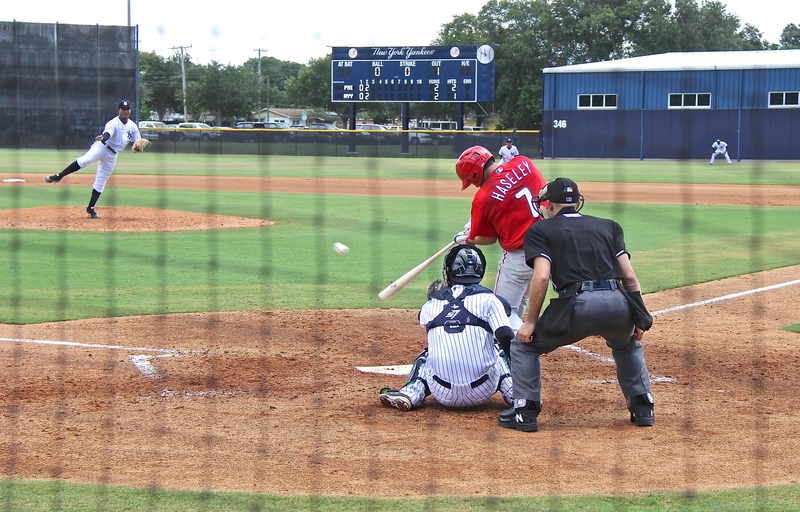 Here is video of the check swing called a third strike of Haseley’s first at bat first at bat. I didn’t think he swung. neither did the loud fan standing next to me. 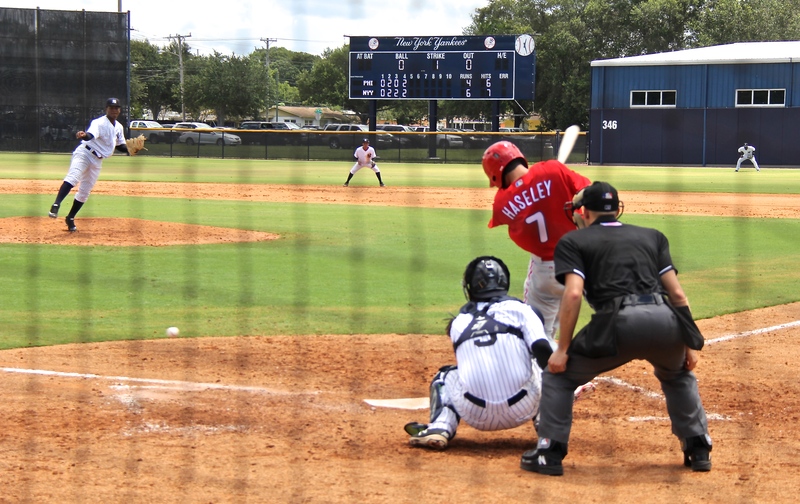 Video of Haseley’s second at bat, and first professional hit. He attacked the first pitch. 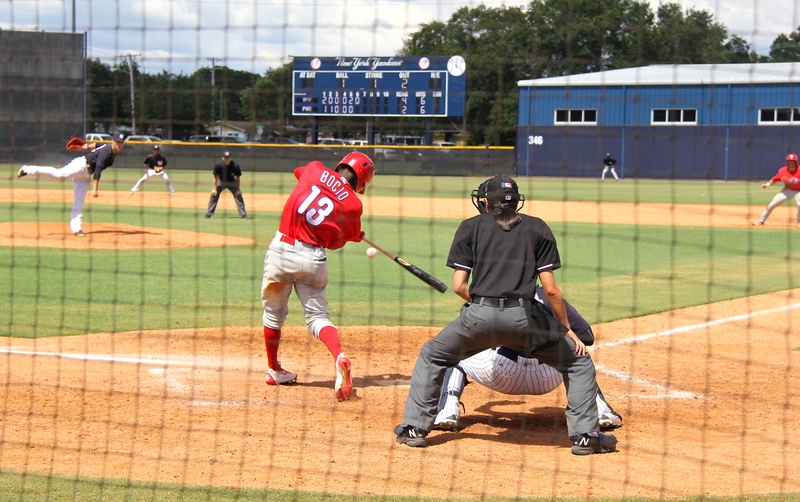 Haseley’s third at bat. Ball headed for the hole. Rafael Marchan got spiked applying a tag at the plate (successfully). Kipp Moore replaced him and took 2 follow throughs in the back of the head. Jimenez picked a runner off first. 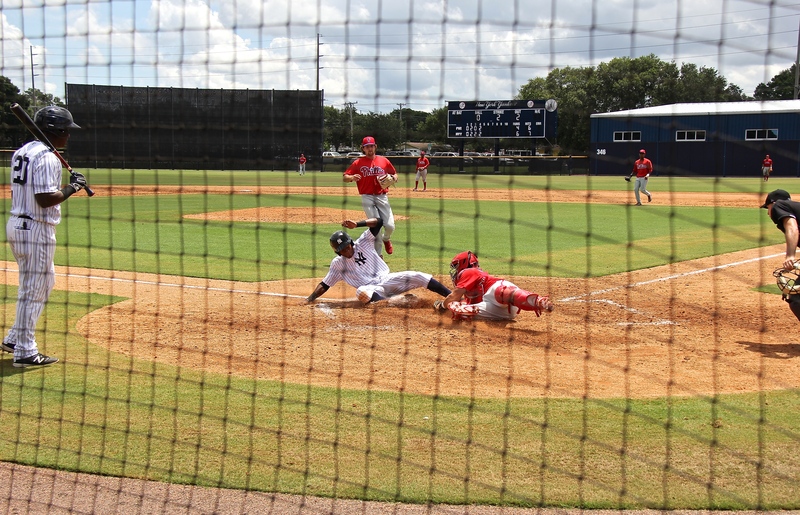 Rafael Marchan retrieved a wild pitch and beat the runner to the plate, pitcher Justin Miller in the background. Marchan got his glove in front of the plate, and the runner’s spikes slid over the glove into his throwing hand. Game Two: Almost a complete turnover of personnel, only Pelletier played in both games. Sandro Rosario gave up 4 runs on 5 hits and 3 walks in 4.1 innings, and struck out four. 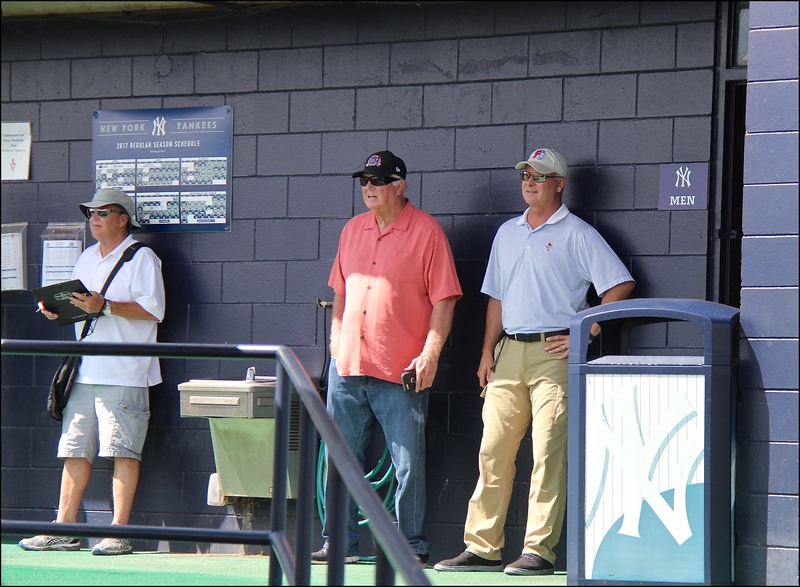 Anton Kuznetsov, the Russian lefty, pitched 2.2 innings and held the Yankees scoreless giving up a hit and a walk. Keudy Bocio went 2-2 with 2 RBI on a SF and a single. Simon Muzziotti, Lenin Rodriguez, and Caleb Eldridge each hit doubles. L. Rodriguez scored twice. Muzziotti scored on a wild pitch. 6/26 – GCL Phillies placed RHP Sutter McLoughlin on the 60-day disabled list. 6/26 – RHP Jesus De Los Santos assigned to GCL Phillies. 6/26 – RHP Rafael Carvajal assigned to GCL Phillies. 6/26 – SS Brayan Gonzalez assigned to GCL Phillies. 6/26 – LHP Jakob Hernandez assigned to GCL Phillies. 6/26 – IF Jesus Azuaje assigned to GCL Phillies. 6/26 – OF Keudy Bocio assigned to GCL Phillies from Phillies Ext. Spring Training. 6/26 – OF Adam Haseley assigned to GCL Phillies. 6/26 – OF Kevin Markham assigned to GCL Phillies. 6/26 – LHP Denny Martinez assigned to GCL Phillies. 6/26 – RHP Francisco Morales assigned to GCL Phillies. 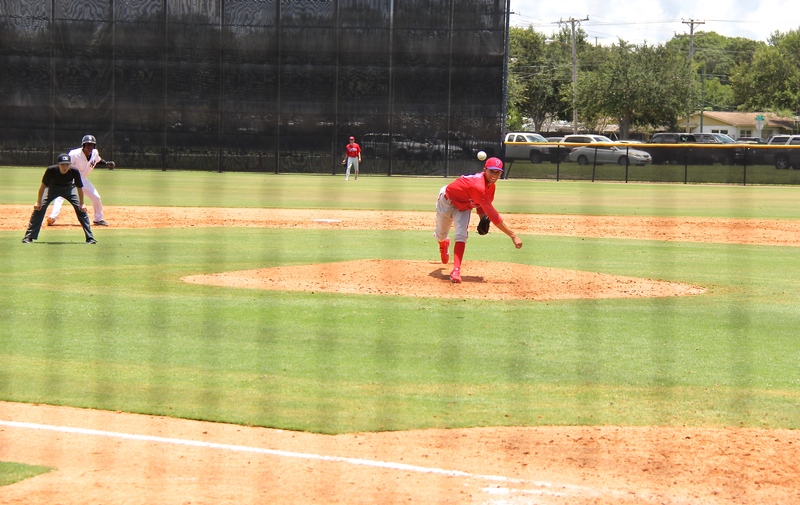 6/26 – LHP Jose Jimenez assigned to GCL Phillies. 6/26 – C Kipp Moore assigned to GCL Phillies. 6/26 – RHP Sati Santa Cruz assigned to GCL Phillies. 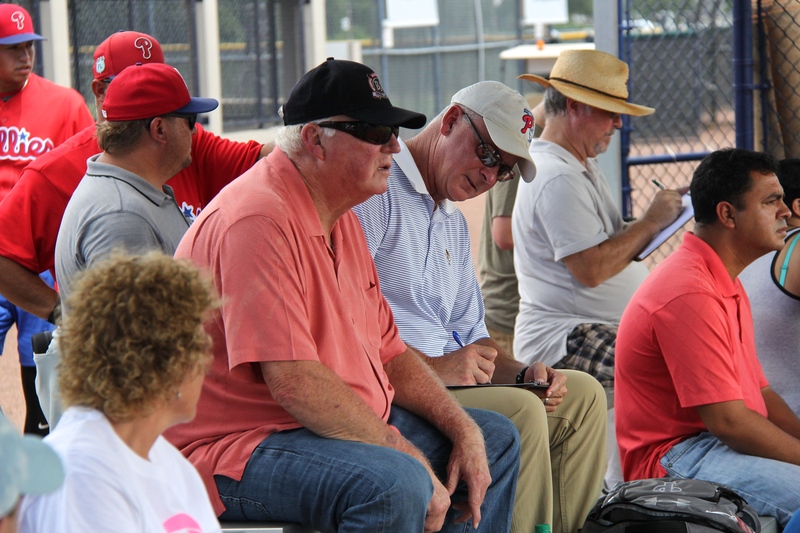 6/26 – RHP Victor Sobil assigned to GCL Phillies. 6/26 – OF Yahir Gurrola assigned to GCL Phillies. 6/26 – OF Danny Mayer assigned to GCL Phillies. 6/26 – Clearwater Threshers sent SS Zach Green on a rehab assignment to GCL Phillies. 6/25 – Phillies signed RHP Sati Santa Cruz. 6/25 – Phillies signed LHP Jakob Hernandez. 6/25 – Phillies signed IF Jesus Azuaje. 6/25 – Phillies signed OF Kevin Markham. 6/25 – Phillies signed OF Yahir Gurrola. 6/25 – Phillies signed OF Danny Mayer. 6/25 – SS Nick Maton assigned to Williamsport Crosscutters. 6/25 – OF Austin Listi assigned to Williamsport Crosscutters. 6/25 – 3B Jake Scheiner assigned to Williamsport Crosscutters. 6/25 – 2B Brian Mims assigned to Williamsport Crosscutters. 6/25 – RHP Connor Brogdon assigned to Williamsport Crosscutters. 6/25 – RHP Addison Russ assigned to Williamsport Crosscutters. 6/25 – LHP Zach Warren assigned to Williamsport Crosscutters. 6/21 – Phillies announced the signings of Adam Haseley, Spencer Howard, Jake Scheiner, Nick Maton, Jack Zoellner, and Connor Brogdon. 6/19 – Clearwater Threshers placed Alberto Tirado on the temporarily inactive list. 6/19 – 3B Jan Hernandez assigned to Clearwater Threshers from Phillies XST. 6/19 – Will Stewart assigned to Williamsport Crosscutters from GCL Phillies. 6/19 – Kyle Young assigned to Williamsport Crosscutters from GCL Phillies. 6/19 – Jhon Nunez assigned to Williamsport Crosscutters from GCL Phillies. 6/19 – Justin Miller assigned to Williamsport Crosscutters from GCL Phillies. 6/19 – Cole Stobbe assigned to Williamsport Crosscutters from GCL Phillies. 6/19 – IF Greg Pickett assigned to Williamsport Crosscutters from GCL Phillies. 6/19 – Luis Carrasco assigned to Williamsport Crosscutters from GCL Phillies. 6/19 – Josh Stephen assigned to Williamsport Crosscutters from GCL Phillies. 6/19 – Jhailyn Ortiz assigned to Williamsport Crosscutters from GCL Phillies. 6/19 – Rodolfo Duran assigned to Williamsport Crosscutters from GCL Phillies. 6/19 – Malvin Matos assigned to Williamsport Crosscutters from GCL Phillies. 6/19 – Randy Alcantara assigned to Williamsport Crosscutters from GCL Phillies. 6/19 – Andrew Brown assigned to Williamsport Crosscutters from GCL Phillies. 6/19 – Gregori Rivero assigned to Williamsport Crosscutters from Phillies XST. 6/19 – 2B Jesus Henriquez assigned to Williamsport Crosscutters. 6/19 – C James Lovett assigned to Williamsport Crosscutters. 6/19 – LHP Orestes Melendez assigned to Williamsport Crosscutters. 6/19 – RHP Gustavo Armas assigned to Williamsport Crosscutters. 6/19 – Sutter McLoughlin assigned to GCL Phillies from Williamsport Crosscutters. 6/19 _ Aaron Brown assigned to GCL Phillies from Williamsport Crosscutters. 6/19 – Bailey Falter assigned to Phillies XST from Williamsport Crosscutters. 6/18 – RHP John Richy assigned to Lehigh Valley IronPigs from Reading Fightin Phils. 6/18 – C Greg Brodzinski assigned to Reading Fightin Phils from Phillies XST. 6/17 – DSL Phillies White activated RHP Carlos Francisco. 6/14 – Phillies signed LHP Jhordany Mezquita. It’s a good day when 2 of your #1 picks go 3 for 4 with a double and a HR .King Kong Kingery with 2 thats 2 home runs . I really hate to get on the Walding bandwagon so I won’t. But he’s been hot in June and has hit in 8 straight games and 10 of his last 11 games. April and May were not good months for Walding but he’s heated up to a .313/.371/.825 June. If June 1st was his stake in the ground and the rest of the year will be like June has been, I’ll jump on that bandwagon. The guy has power and a pretty good batter’s eye, evidenced by his high BB totals and OBP. But he can strike out with the best of them. He’s 24 and in AA so he’s into that long in the tooth area but improve the hit tool and reduce those Ks and he could play some in Philly. I’m definitely not on board. He’s 24 and a product of the Reading ballpark. Hopefully I’ll be wrong so he can supplant Sir Swings A lot that the Phillies currently have. Someone posted the other day Walding is slugging 700 at the small homer happy park 400 everywhere else. That trend will not continue when he moves up a level. When Cozen was doing it in Reading everybody thought he was great but now Walding does it and its the Park. Clearly you guys don;t know what your talking about. I had Cozens and Green tied at the hip when they were first drafted. I actually thought Green was the better prospect because he played 3B. Green has been injury prone since and now you see Cozens knocking on the door to the big leagues and Green a passing mention in our comments section. I’d like to see him in Reading by the end of the year but I think he has to go through A+ first. I kinda thought Green was done for after the hip operation and the move to first base. Good for him to get back on the diamond, however he is way to old for the GCL and while these stats are encouraging it taken with the smallest grain of salt. That’s a naughty word around here, Rei….but go for it. I think we will see Mickey Money with some more homers next season. Another off-season of strength training and conditioning should do the trick. For a pretty fresh 19 year old, he’s holding his own. And this will be his first full season of pro ball. Cozens struggling a bit over the past ten days but still has several homers. His first month was a struggle but he’s shown he should be considered more than a platoon. Struggles against LHP but that seems to fluctuate as he’s been pretty streaky against them. Currently salivating over an OF of Cozens, Williams and altherr. That may not be a popular opinion but there’s a perfect mix of power at all three positions, speed and avg OBP. I’m growing to love Cozens’ long term chances for success but I wouldn’t mind him staying in Lehigh until Sept callups. He needs to marinate in that junk ball environment especially vs lefties. It’s just about time for Williams to make or break at the major league level. I think Gallo literally has 3 options at the plate, they strike out 75 percent , then some percentage of walk and homer. Nothing Judge did in any minor league year said he would bat 330 and have 25 homers before the Allstar break. They are similar both played other sports and both struck out a lot in the minors. I’m sure there are more similarities. Very much so. He may have to bumble and fumble his first big league season (’18?) but once he settles in like he appears to be in AAA, I can see Dave “the Cobra” Parker comps as well. The arm, too. Plus Quinn, at some point….. and Pullin is a wildcard – he can hit any fastball but AAA will be a test as to whether he can hit off speed. Question: is there a MLB limit on the amount of minor leaguers any one orginization can have? Follow up: is this the first year the Phillies have carried more than usual as noted by the paper transactions or (actually 2 part follow up) is it because Jim is listing all the paper moves? They can definitely limit the number you want to keep around because of the rule 5 draft so to many good prospects and not enough spaces and some people are gonna get poached. (E) 35 players on its Rookie Reserve List for each Rookie classification Club that it owned or with which it had a PDC during the previous season. (A) The maximum number of players who may be placed on an Active List for a Major League Club shall be 25 from opening day until midnight on August 31 of the same championship season, at which time the number of players on the Active List of a Major League Club may be increased to 40. (B) The maximum number of players on the Active List of a Class AAA Club shall be 24. (C) The maximum number of players on the Active List of a Class AA Club shall be 24. (D) The maximum number of players on the Active List of a Class A Club shall be 25. (E) The maximum number of players on the Active List of a Short-Season A Club shall be 30, only 25 of whom may be in uniform and eligible to play in any given game. (F) The maximum number of players on the Active List of a Rookie Club shall be 35, only 30 of whom may be in uniform and eligible to play in any given game. Anyone else make a comp of Jetpax to an Utley Lite? Compact line drive swing, max effort, 2B, and gritty? More Speed for Jetpax and more power for Utley? The Utley-Kingery comparisons seem appropriate. I’m not sure how much less power Kingery has. He might grow into comparable power. I don’t see Kingery in the 30+ homerun club at 5’10 180. Strikes me as a 15-20 guy with a bunch of doubles. It strikes me as odd to see a player with more HRs (20) then 2Bs (18). Well, he is at 20 already – do we see 40 by years end? Are you saying that all white people are max effort/gritty, or that non white people are unable to be so? Or are you projecting your own racism onto somebody else of whom you know nothing about? I like the load – he’s definitely got a little Joey Votto thing going on there. Impressive videos. Thanks! Catch funny I don’t like the load, he has too much movement imo. scary. I Want to see him on fastballs in on him. There’s a group of young-ish hitters right now that have generated a ton of power with this new style leg kick, including Josh Donaldson, whose career did a 180 when he changed his batting style with the kick, which both improved his timing and increased his power. That’s what I’m seeing from this kid and I like it. I don’t dislike the leg kick. Leg kicks only voter me if there’s excessive head or hand movement going on with it. Here he’s got some head movement, but I think that’ll be ironed out before he gets to spring training next year. What I don’t like is how the bat lays on his shoulder until he’s ready to start his hands moving forward. But to me, those are both little things I’d expect to be corrected in the offseason. Cole Irvin starting for AA. Quick riser! I hope that means Suarez gets promoted to Clearwater. He has put in his time at Lakewood. Somebody posted last week that Taveras was going to Reading but it didn’t happen. Yes, I’ve been really impressed with him. He’s been a really super under-the radar find this year. Seems to have decent velocity for a lefty too! He was just drafted last year in the 5th round and has put up consistently good numbers. He does not strikeout a ton of batters, but seems to get guys out. I would like to add that because the Phillies don’t have a LHP near the Majors, they may hope that Irvin can make that jump. 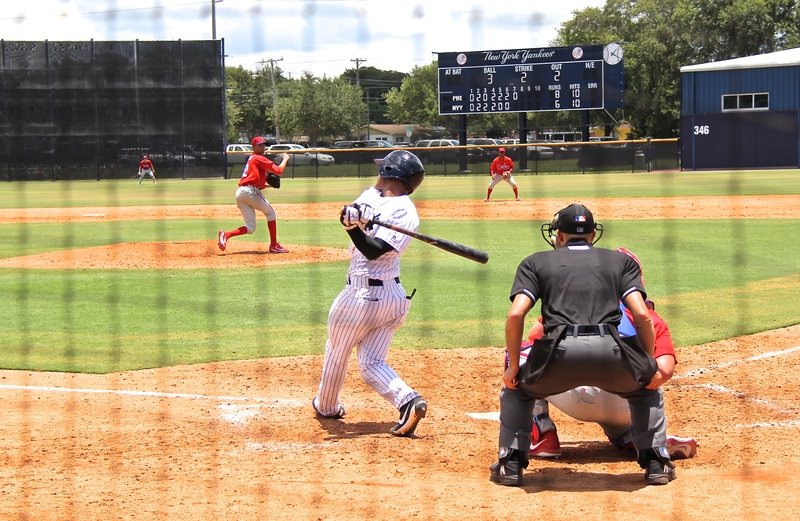 GCL posted a 7 spot in the 1st inning today. Muzziotti (dh today) singled and scored on Haseley’s 2 run triple, followed by Zach Green’s 3rd HR. He’s playing 1b today so I guess he can play both corners. 7-4 in 4th inning. Zach Green and Haseley in GCL just isn’t fair. …..although you wouldn’t know it by the Fightins’ box score today. Thumping Harrisburg! Green is technically rehabbing. Hasely has been off for a couple of weeks so these games are just warm up for him. Once his rehab stint is over, send him to AA. martin has pop but his BA is horrid. Green has already experienced LKWD & CLW. I should add he showed pop at each…when healthy. Cole Irvin looks the part of a pitcher. Tall, lanky with good mound presence. Has a smooth delivery without much wasted motion. Repeated his delivery very well and was throwing a decent looking slider/curve ball that generated quite a few swings and misses. He gave up a few base hits but I can only remember one of those that was really hit hard..
Reports on Tocci are correct in that he looks like a terrific minor league ball player but needs muscle. He hit a ball about as hard as I think he can that hit about midway up the LF wall for a triple. He really glides on the bases and made it to 3b easily. Hit a couple of other balls on the nose that were at outfielders but the ball just doesn’t jump off the bat when he makes contact..
Coppola, Tromp, Canelo were decent ball players but didn’t appear to me to be more than solid minor league talent. Coppola was about the same size/build as Tocci.. Canelo’s 2 run single was a pop-up that fell between the SS, 2b, CF, and LF as they all looked at each other. Kingery’s 2b replacement Stankiewicz had 4 hits but it took about 20 hops for those 4 hits to get to the OF. As for the HBG team, I didn’t see anyone on the field for them that looks close to being a major league talent. They had no-one that stood out. Thoughts on Shane Watson’s pitching today….and possible late inning reliever down the road. He had decent velocity but it didn’t seem to translate. He was 93-94 on the gun but they were getting good swings. Got out of one inning on a hard-hit 1-hopper to the ss for a DP. Didn’t see great off speed stuff. On the plus side, he did not give up any runs in his multiple innings of work..
Didn’t Tromp Go 2 for 4 with a Hr and 3 rdi’s. I heard he has plus speed and plus power for CF . Tromp didn’t play CF, he was in Left. I didn’t see plus speed but can’t say that I saw him in a situation where he would be able to show it off..